Before creating the integration there are some require setting or parameter you must know. On the integration object, there are fields, which are required, and fields, which are optional. The only one field that is required to successfully save the integration is the name fields. Other fields are optional. However, you should give your integration a meaningful description so that you know later what is the object or goal of this integration. E.g., the max number of retry, which is an optional field, which can be set. On the other hand, there is some important parameter, which is optional and has default value already when you do not set them… For example, the parameter “Max Number of Retry” is default by 5 which mean that failed or pending message are going to be reprocessed automatically only 5 times. If exceed 5 times the message will remain in status failed/pending forever. If your requirement is to do message reprocessing more the 5 times (default value) you can set this parameter to any value you like for example 17. This would mean that the failed/pending messages would be re-process max. 17 times. Please see the example in the picture. Note that creating the integration object is a pre-requisite for further learning steps like creating an interface, mapping etc… Without having an integration, you cannot continue to develop an interface. These fields are obsolete and should not be used. For reference please read the SKYVVA Administration Guide. There is also the section called “Agent“. This is not relevant for this part of the document. This functionality will be explained in another document. The first task in developing the interface is to create an integration. An integration can be though as a logical group-to-group logical interface together. For example, you could have an integration holding interfaces for the region Asia and Europe. Other logical separation could be on integration for the transactional interfaces and another one for the master data interfaces. 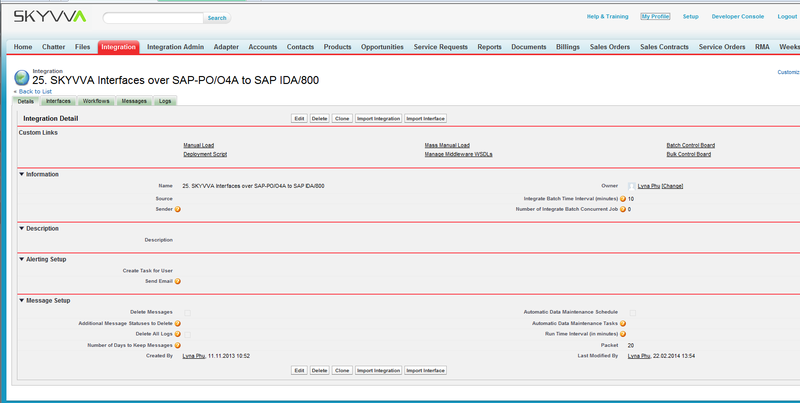 To create an integration log on to the instance of your choice where the SKYVVA software has installed. 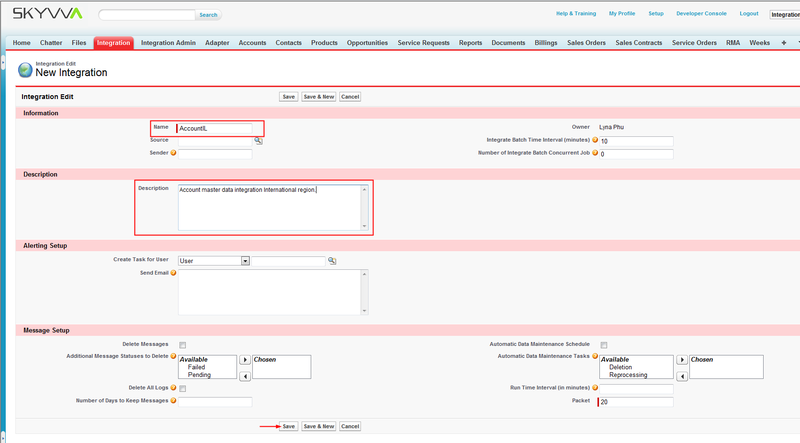 Open the Integration Admin tab and choose the tab “Integration”. Click on the button “New Integration” to create a new integration. You need only to specify the Name of the integration e.g. “AccountIL” and give a short description. Other available fields can leave at its default value. Click button “Save” to save your integration. You will get five Tabs: Details, Interfaces, Workflows, Messages, and Logs.